Who is the best over all soccer player in the world? 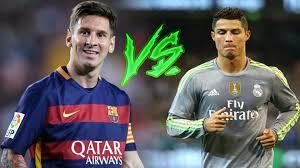 Cristiano Ronaldo and Lionel Messi are two definite candidates for that title. Messi has the lead with most goals (343) and Ronaldo right behind him with 334. Both Ronaldo and Messi are rated 10/10 in shooting, considering how many goals they have scored. Although they both have 10/10 rating in shooting, Ronaldo comes out on top with the most scores using their head, rated 9/10 and Messi 7/10. But Messi comes back with a 10/10 in dribbling and Ronaldo with 8/10. Messi also has a 9/10 in passing and Ronaldo with an 8/10. Messi continuing his reign over Ronaldo, tops with a rating of 9/10 free kick average and Ronaldo with a 8/10. However, Ronaldo has a rating of 9/10 on least penalties, beating Messi who has a 7/10. It should come as no surprise that Ronaldo has been rated 10/10 on physical build, beating Messi with a rating of 7/10. They both are very fast but Ronaldo comes out on top when it comes to sprinting: running at 24.4 miles per hour. Both players are amazing as both have many awards. Despite this, there is no doubt that Ronaldo is better overall. He not only is very close towards Messi’s amount of goals, he also has more height, strength, and speed over Messi. Ronaldo is never rated less than 2 against Messi, proving that the best overall player really is Cristiano Ronaldo.